You and/or your organization may participate in the scheduled activities or initiate events (forum, film viewing, ecumenical service, exhibit, cultural night, solidarity gathering, fund-raising, etc.) to support the campaign. Contact us at 09166114181, (02) 7992009 or email uma.pilipinas@gmail.com. 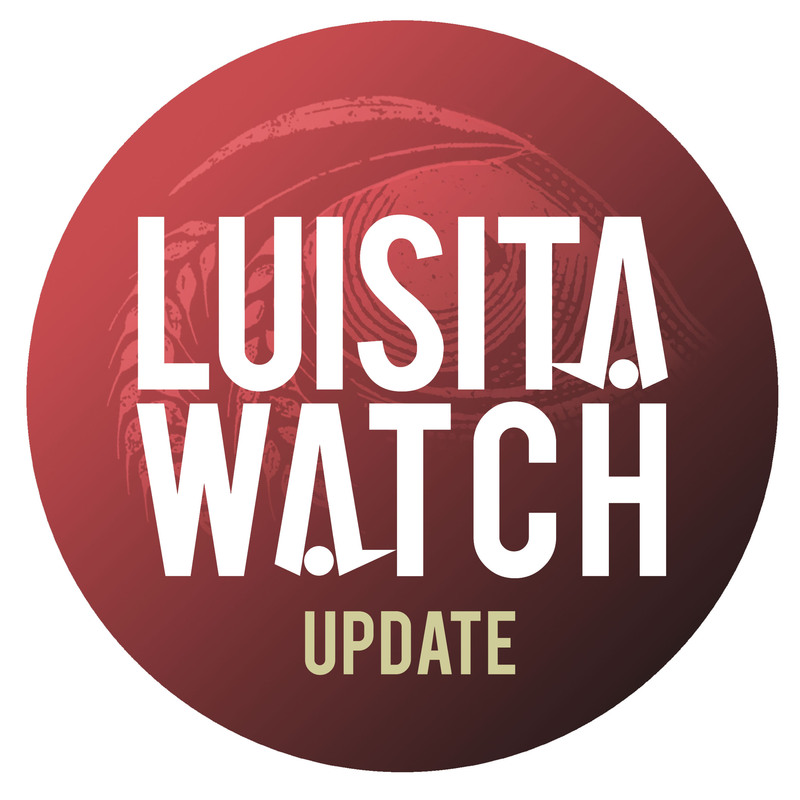 Follow Luisita Watch on Facebook, Twitter and Instagram. November 16 is marked every year as National Day of Protest of Farmworkers and Agricultural Workers and International Day of Action Against Trade Union Repression. On this day 12 years ago, seven protesters were killed and hundreds of others were seriously injured in the state’s violent dispersal of the massive sugar workers’ strike in Hacienda Luisita. 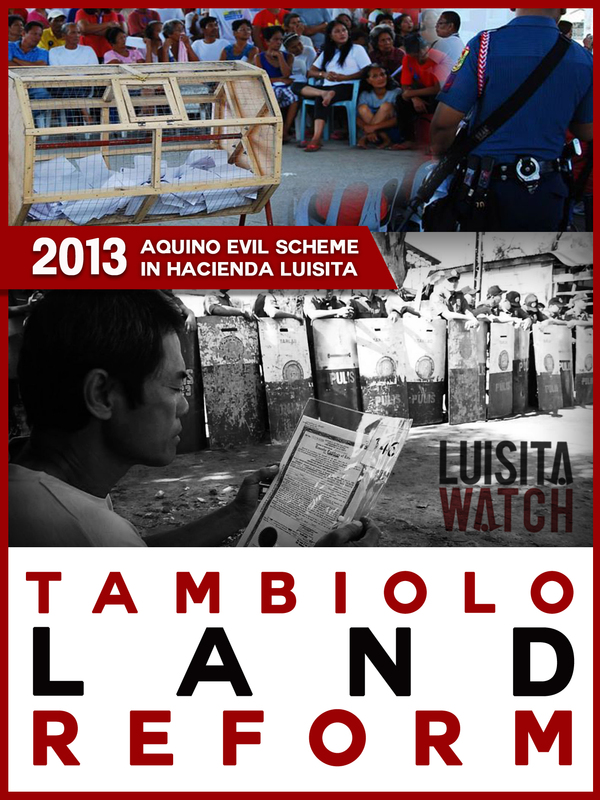 Twelve years after the Hacienda Luisita massacre, the victims continue to seek justice. Farmworkers assert their land rights through the BUNGKALAN land cultivation campaign and by forging wider cooperation and collective effort among their ranks. Luisita farmers continue to fight for land and life. 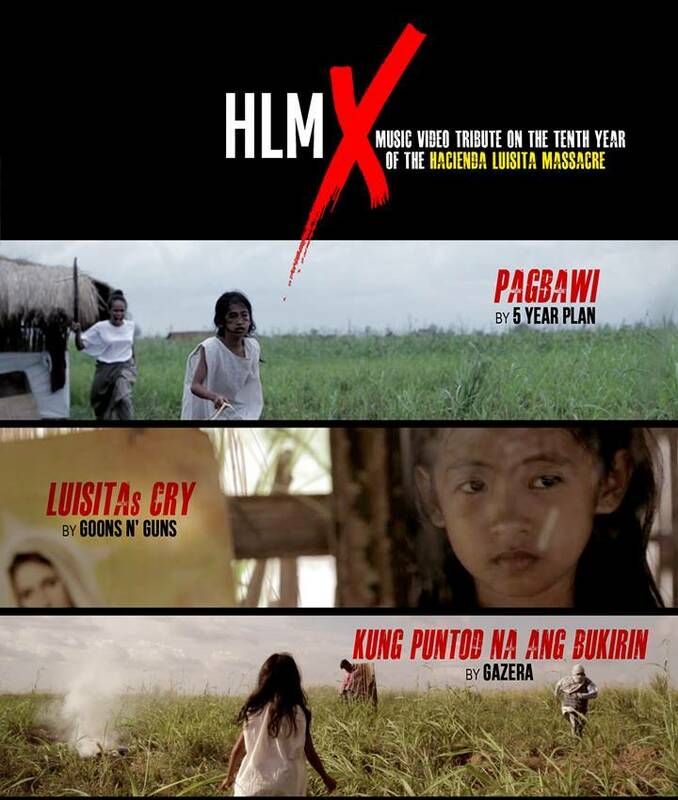 For the 12th anniversary of the Hacienda Luisita massacre, farmworkers and their supporters will launch a 3-day Cultural Caravan to rekindle the lessons of the historic People’s Strike. Inspired by the militant tradition of sugar workers in Escalante, Negros Occidental, a theatrical reenactment of the Luisita Massacre will also be mounted to impart mass-oriented values and principles, and to memorialize the sacrifice of Luisita’s martyrs in the struggle for land and justice. Farmworkers must continue to strengthen their unity for genuine land reform, and forge broader solidarity with various sectors such as church people, the academe, agricultural experts, professionals, artists, writers and cultural workers. The youth must carry forward this decades-long struggle by planting the seeds of change for the next generation of Luisita farmers. The Alyansa ng mga Manggagawang-Bukid sa Asyenda Luisita (AMBALA) and Unyon ng mga Manggagawa sa Agrikultura (UMA) will lead these activities with various militant people’s organizations such as the Kilusang Magbubukid ng Pilipinas (KMP) and Luisita Watch, a broad network of supporters of the farmers’struggle for land and justice. 12. Mula nang mabakuran noong 2013 ang mga lupa sa Balete at Cutcut 2nd, hanggang sa kasalukuyan, nananatili itong agrikultural na lupa, na itiniwangwang lamang at pinabayaan ng TADECO. 5. Dapat pa nga na pagbayarin ng daang milyong pisong danyos ang TADECO at mga Cojuangco – Aquino sa walang kaluluwa nitong pambubuldozer sa mga gulay at palay at pangwawasak at panununog ng kubo, at pagpapalayas sa mga magbubukid nitong 2013 hanggang 2014 sa kabila ng belated na deklarasyon ng NOC ng DAR. 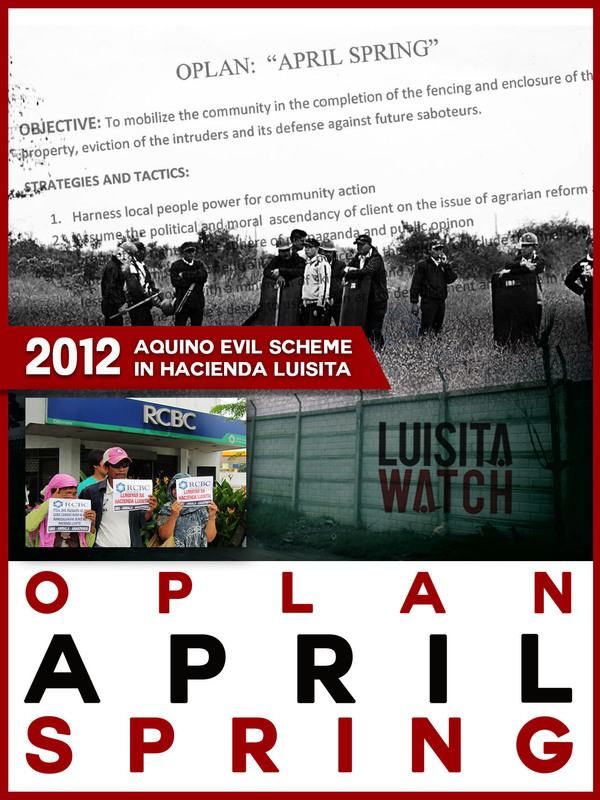 The TSPP is the latest in the list of BS Aquino’s atrocities against Hacienda Luisita farmers under his term. The Supreme Court already ruled for total land distribution in 2012, but Aquino is clearly doing everything in his power – from brute force to hiding behind a supposed “environment-friendly” project to undermine the farmers’ legitimate demands for land and justice. They wants it, they needs it. President Benigno Simeon “Noynoy” Aquino III and kin continue to hold on to their “precious” Hacienda Luisita, the highly-controversial sugar estate in Tarlac province, Central Luzon which has been in the clutches of the Aquino-Cojuangco landlord clan since the late 1950s. Like his mother former President Corazon “Cory” Cojuangco-Aquino, BS Aquino also promised social justice and land reform in Hacienda Luisita in his electoral campaign some six years ago. And just like those of his mother’s, BS Aquino’s actions have all proven flagrantly inimical to such promise. 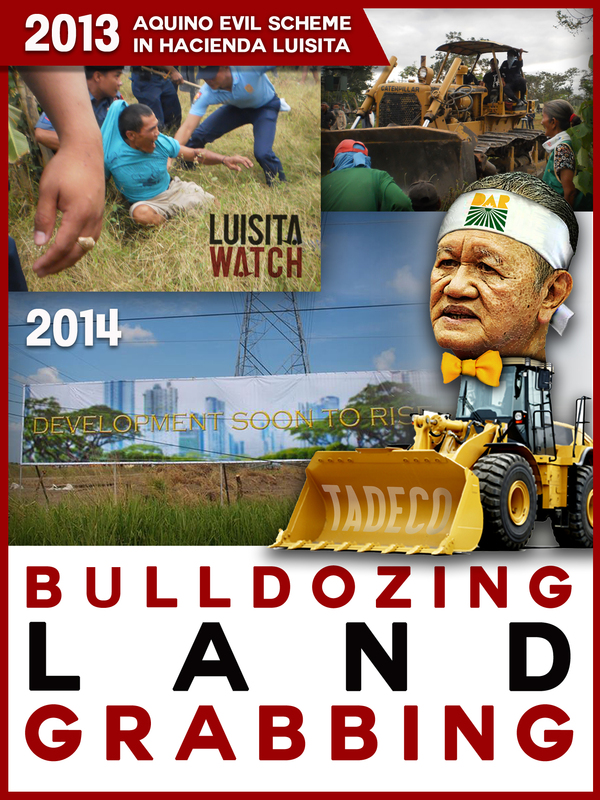 There’s enough reason in fact to believe he did everything in his powers to subvert the landmark Supreme Court (SC) ruling for total land distribution in Hacienda Luisita. Farmworkers can be fairly blunt about it:Aquino’s purported land reform accomplishments in Hacienda Luisita are all freaking lies propagated by the president’s loyal and well-paid cabal of yellow zombies, trolls, and spin doctors. It is for this reason that land reform and human rights advocates saw the need to form the Luisita Watch network in 2014. Convened by the national agriworkers federation Unyon ng mga Manggagawa sa Agrikultura (UMA), Luisita Watch took on the task of documenting and exposing the real score in Hacienda Luisita as far as the Luisita farmers’ continuing struggle for land and justice is concerned. And so behind the barrage of official information from Malacanang and concerned government agencies, and being on hand to witness the enduring agrarian saga called Hacienda Luisita, what exactly did Luisita Watch find? 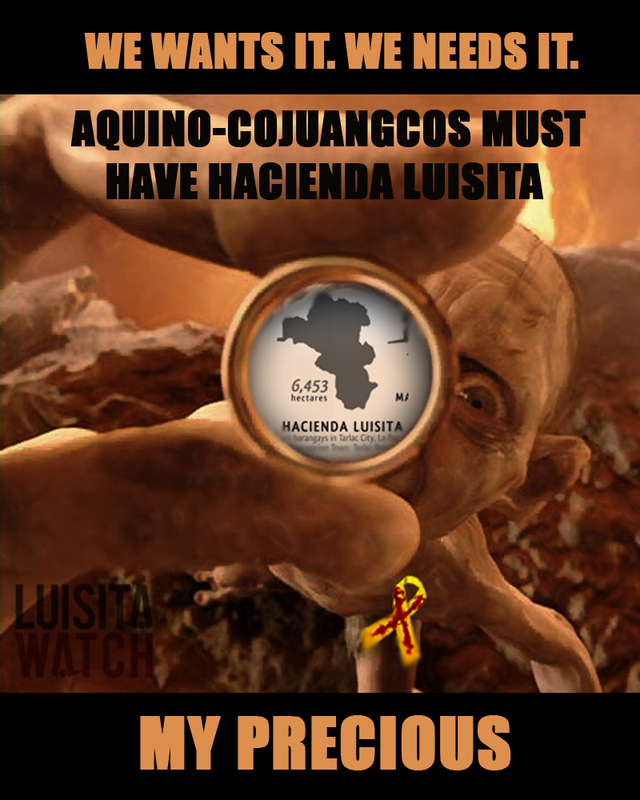 Here’s a 10-point “how to hold on to your precious” list, enumerating how Aquino sort of morphed from a presumably harmless Smeagol at the start of his popular presidency into a bloodthirsty Gollum viciously trying to have his way against the “small people,”the farm workers who are fighting to reclaim Hacienda Luisita. 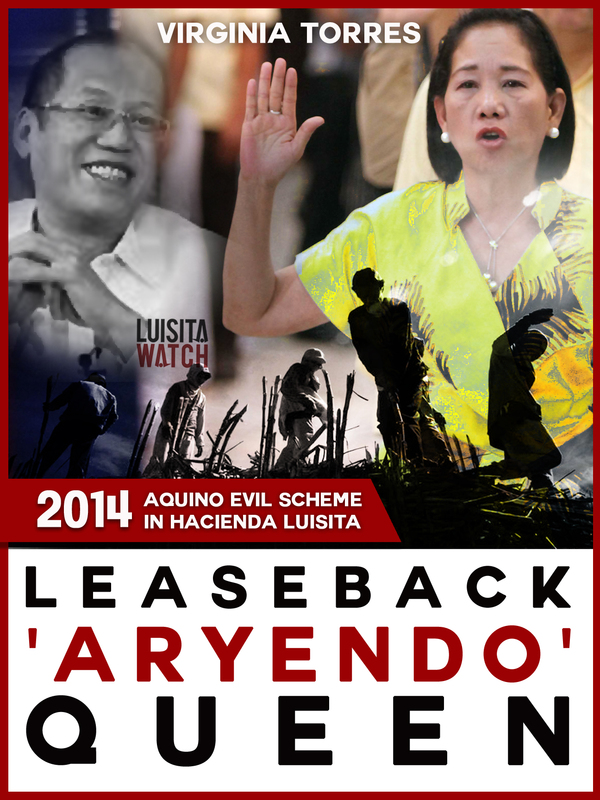 BS Aquino’s first order of business as haciendero (landlord) president was to keep silent on his family’s sly maneuvers to bring the oppressive Stock Distribution Option (SDO) scheme back on track in Hacienda Luisita. Remember the SDO? It was when ‘lucky stockholders’ received the hideously paltry sum of Php 9.50 per day for the backbreaking task of cutting and hauling sugarcane. 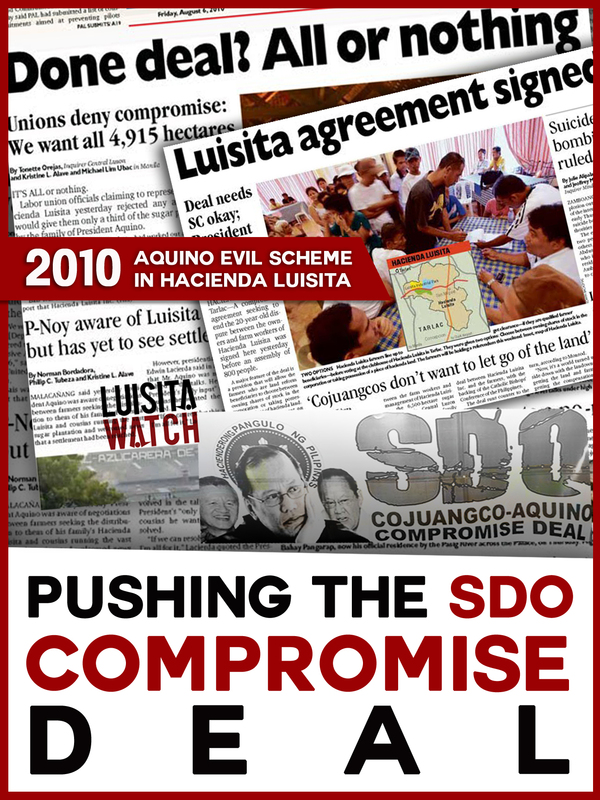 In August 2010, acts of bribery and fraud led to the signing of the Hacienda Luisita “compromise deal” between the management of the Hacienda Luisita, Inc. (HLI) and a handful ex-union leaders who misrepresented the thousands of Luisita farmworkers as being amenable to bringing the despicable SDO back. BS Aquino immediately distanced himself from the controversy by giving a token statement that the matter was “intra-corporate dispute,” and that he had divested his shares in HLI after assuming the presidency in June 2010. Farmworkers led by the Alyansa ng mga Manggagawang-Bukid sa Asyenda Luisita (AMBALA) and United Luisita Workers Union (ULWU), Alyansa ng Magbubukid sa Gitnang Luzon (AMGL), Kilusang Magbubukid ng Pilipinas (KMP), UMA, various multi-sectoral organizations under the Bagong Alyansang Makabayan (BAYAN) and other support groups and alliances launched various mass actions to expose and oppose the compromise deal and subsequent evil maneuvers by the Aquino-Cojuangcos. BS Aquino’s much hyped “anti-corruption” crusade to have former Chief Justice Renato Corona impeached and convicted is now widely seen as Aquino’s “first step” to retain control of Hacienda Luisita. 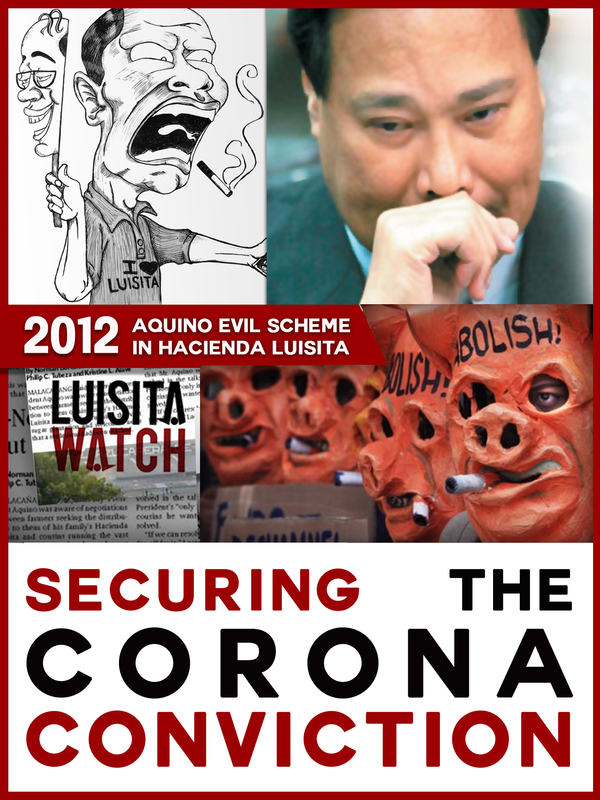 Corona, a midnight appointee of despised former President Gloria Macapagal-Arroyo, was the principal proponent of the April 24, 2012 Supreme Court (SC) decision on Hacienda Luisita. Corona was handed the guilty verdict in May, barely a month after the SC issued its final and executory decision for total land distribution in Hacienda Luisita. Corona’s conviction has largely been hailed at the onset as a major accomplishment of his Daang Matuwid (Righteous Path) campaign. The trial however would soon be exposed as an ugly act of reprisal involving millions of taxpayers’ money coursed through the illegal Disbursement Acceleration Program (DAP) purportedly used by Aquino to bribe Senator-judges for an assured guilty verdict. Is anyone even aware that the HLI still owes their “stockholders” – the farmworkers – a staggering Php 1.33 billion? The audit of these assets – proceeds from the sale of 80 hectares traversed by SCTEX and a 500-hectare disputed property – is among the provisions of the 2012 SC decision. Of late, the SC has appointed three auditors to take on this job but HLI, DAR and the Aquino government have so far succeeded in delaying the process. This kind of deception coupled with bribery and violence form part of Oplan April Spring, a special operations campaign to discredit the farmers’ struggle and to project the landlords as pro-poor and pro-development. 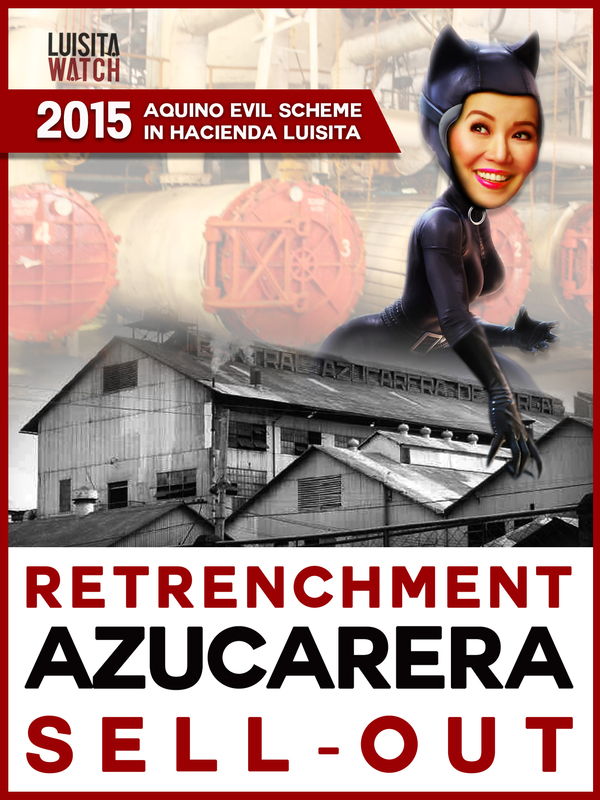 This plan was hatched by the Aquino-Cojuangcos and RCBC, a Yuchengco-owned commercial bank claiming ownership of the disputed property. From 2011 to 2013, security agents, goons and local police engaged in violent attacks to destroy the farmers’ bungkalan or land cultivation initiative in the area. After the ensuing barrage of threats, criminal suits and pay-offs, RCBC managed to fence off the property. A few local leaders succumbed to bribery, but the pressure only tempered the rest of the farmworkers to carry on with the fight. Today, farmworkers continue to expose this unpaid debt amid the plan to build a solar power plant within the disputed RCBC property. This public-private partnership (PPP) project between the President, Department of Energy and Petrogreen, a sister company of RCBC, conceals landgrabbing behind a purportedly environment-friendly endeavor while ensuring further corporate profits at the expense of the displaced community. Only in Luisita: lot allocation through lottery drum (tambiolo) raffle, making fools out of farmworkers in a manner too crass to even be considered funny bythe makers of our favorite noon-time shows. The farce however which the Department of Agrarian Reform (DAR)brought to each of the ten Luisita villages could have passed for your usual government carnival if not for the fact that the road show also featured the intimidating presence of state forces in full battle gear – long firearms, fire trucks for dispersals, jail buses for arrests, the works. Farmworkers were practically made to participate at gunpoint. inaction on the coverage of all agricultural lands in Luisita claimed by TADECO, Central Azucarera de Tarlac (CAT) and other Cojuangco firms, including the appeal for revocation of a conversion order covering 500 hectares under RCBC, LIPCO and Lusita Realty Corporation (LRC). Luisita farmers are clamoring for free land distribution, a just demand given the history of the estate. Two days before Christmas 2013, Luisita farmworkers were picketing in front of the Philippine National Police (PNP) Camp Macabulos in Tarlac City to demand the release of illegally arrested and detained farmers. When the farmers finally emerged from the facility, one was burning with fever, another was nursing a black eye. They were nabbed and slapped with physical injuries complaints but they were the ones clearly battered by authorities. A photo of a farmer being manhandled by police even went viral online, compelling mainstream press to temporarily dispense with the unwritten protocol of blacking out news on the continuing struggle for justice in Hacienda Luisita. Weeks before, Aquino-Cojuangco goons employed by the Tarlac Development Corporation or TADECO fenced off a 260-hectare area in Balete village, destroying huts and bulldozing crops to forcibly evict farmers. The ‘landgrab spree’ did not end there. February 8, 2014, on the exact date of President BS Aquino’s birthday, worse atrocities were committed. Huts were burned, farm tools and animals looted, children were maltreated and detained, remaining crops were completely wiped out. In the months to come, even DAR employees and village officials were involved in violent incidents in other villages such as Cutcut, Asturias and Mapalacsiao. The victims, ordinary farmers, peasant leaders and advocates were charged with false criminal complaints and harassment suits. The farmers did file counter-charges several times at the Department of Justice (DOJ), but these, as may be expected, have only gathered dust. Even before the DAR’s implementation of ‘tambiolo’ land reform, the Aquino-Cojuangcos have already coerced farmers to enter into leaseback deals brokered primarily by the Luisita Estate Management (LEM), a group of ‘yellow agents’ and former HLI supervisors formed to thwart the farmers’ bungkalan. Subsequently, the chaos caused by the tambiolo scheme naturally complemented this maneuver to reconcentrate land back to the control of landlords. Instead of ensuring the farmers’ right to own and till, papers awarded to beneficiaries only served as collateral in the rampant unlawful leaseback operations called aryendo. Yes, Virginia, illicit leaseback deals in Luisita have been so clandestinely complex and would have gone unnoticed by the public if not for…Virginia Torres. After Torres’s stint at the Land Transportation Office (LTO) was cut short by a viral video showing her playing the slot machine, the Casino Queen and Presidential Kabarilan (shooting buddy) was crowned by Aquino as “Aryendo Queen” of Hacienda Luisita. Torres set up her reign in Mapalacsiao village, where she controls at least 200 hectares for sugarcane production through measly lease offers of Php 7,500 a year to cash-strapped beneficiaries.Those who refused or got in her way faced the wrath of tractors razing farmers’ food crops to the ground. Presidential sister Kris Aquino at one time quite cheerfully told Luisita farmworkers that “they can burn her anytime.” As one of the directors of the CAT sugar mill, Krissy’s effigy was among those burned by angry farmworkers who stormed the DAR on April 24, 2014, two years after the sham implementation of the SC decision.CAT is one of the Cojuangco-Aquino’s “corporate avatars” engaged in landgrabbing. Kris was rather glad the effigy-burning put her, as she said, at par with US President Obama.The TV queen’s comparison may just have been right on the money— her family’s infamous legacy of strafing farmers with machineguns sounds equally disturbing as Obama’s policy of dropping bombs on villages via drones. Kris and rest of the clan – Uncle Peping (Jose Cojuangco Jr ) and Aunt Tingting especially– would then make it appear that they no longer want anything to do with the azucarera. A few months after Kris got “burnt,” her family sold their shares to businessman Martin Lorenzo. Lorenzo established the CAT Resource and Asset Holdings, Inc. or CRAHI which also acquired shares from LRC, LIPCO and other such corporate incarnations of the Aquino–Cojuangco’s cacique avarice. In May this year, almost 700 CAT workers were retrenched and forced to sign “voluntary retirement” papers due to new management policy. Lorenzo and Fernando Cojuangco, the Presidential cousin who remains at the helm of CAT, plan to further dispose of CAT and LRC’s land assets. Are the Cojuangcos really burning bridges with Hacienda Luisita? Or are they just, true to form,expertly covering up the tracks of these new instances of exploitation and further reducing the prospects for a truthful audit of their Php 1.33 billion debt to farmworkers? Florencio “Butch” Abad must really be cherished by the Aquino-Cojuangcos. He was a DAR secretary during Cory’s time when SDO was imposed in Hacienda Luisita. 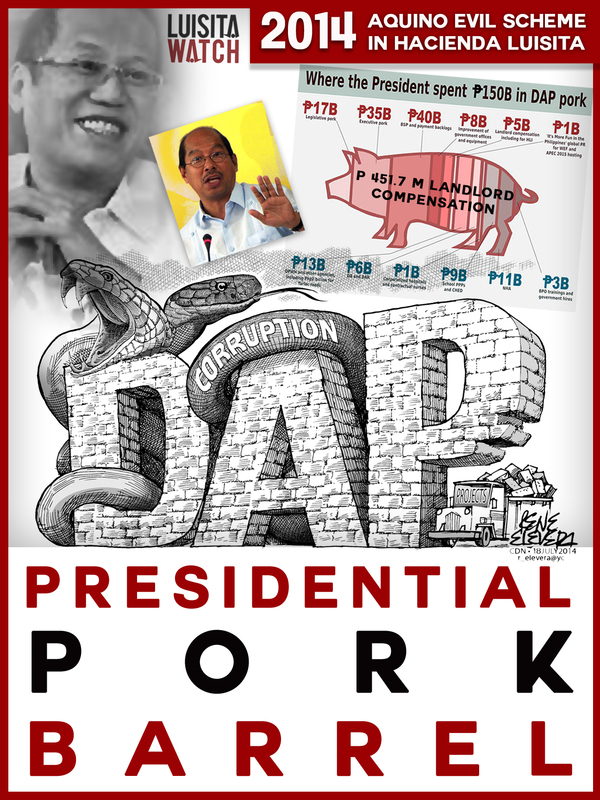 As BS Aquino’s budget secretary, he is credited with inventing the Disbursement Acceleration Program (DAP)or what has also been known to the public as “presidential pork barrel” and which the SC has already declared unconstitutional. From 2011 to 2013, Aquino and Abad, through the DAP, were able to pool in a mind-boggling Php 237 billion in so-called savings. From this amount, Php 144 billion became funds for projects while the rest drifted to pork barrel oblivion. Spending of these discretionary funds depended entirely on “good faith” and it was assumed that the people have actually entrusted this colossal amount of taxpayer’s money to this porky tandem. So how much of DAP was used to grease Hacienda Luisita? Mudslinging among trapos (traditional politicians) revealed that acquiescent Senator-judges were supposedly allotted Php 50 million each to ensure the guilty verdict in the Corona impeachment. DAR later bared that Php 451.7 million landlord compensation granted to Aquino-Cojuangcos was also sourced from DAP. AquinodisbursedPhp 3.5 million in DAP for a small multi-purpose hall in Barangay Central, Hacienda Luisita, said to be a favor to his pet Barangay Captain Edgardo Aguas, also an alleged broker of the aryendo. Concreting of dirtroads are still in full swing in Luisita, a big help to sugar dummies and land speculators hoping to dupe more farmer-beneficiaries into entering illicit deals. Some militant quarters would point out however that “Noynoying”is not at all about passivity or just a state of affairs pertaining to BS Aquino unique brand of sloth or lack of sympathy. 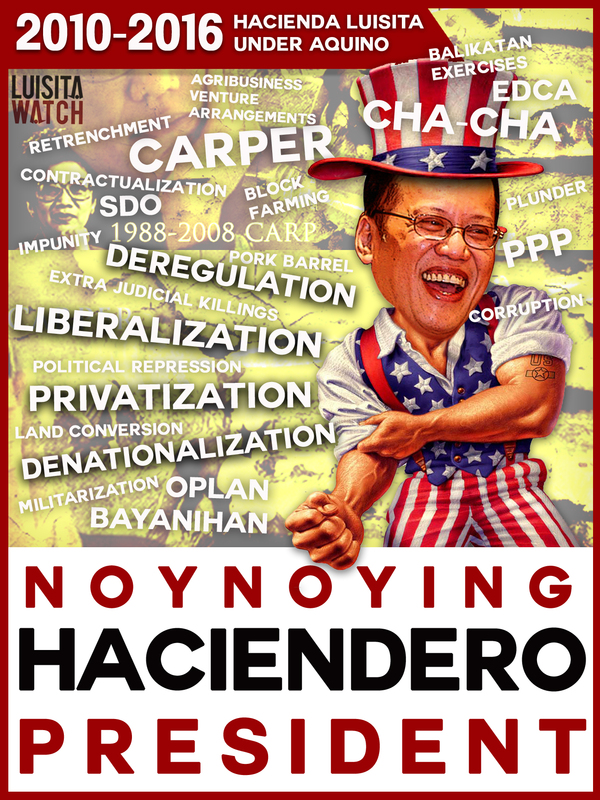 Noynoying, or just being his own haciendero self, is actually an out-and-out active performance of his duty to advance and protect the political and economic class interests of landlords, big business and foreign plunderers. We see this clearly from Luisita to Lianga, where peasants face state-sponsored landgrabbing, repression and killings. Let’s look at government land reform policy. The Comprehensive Agrarian Reform Program (CARP) which was enacted by Cory Aquino in 1988 finally expired after several failed extension programs on June 30, 2014, under the current BS Aquino regime. CARP enabled the oppressive SDO scheme then. CARP is now the DAR’s justification for “tambiolo” land reform. BS Aquino can always claim he can’t do anything about the bulldozing or the farmworkers’appeal for free land distribution – he’s just there to implement existing policy. That’s how he can go full “Noynoying” on land reform. The result: after decades of bogus land reform, 9 out of 10 farmers are now landless, or tilling land they do not own. 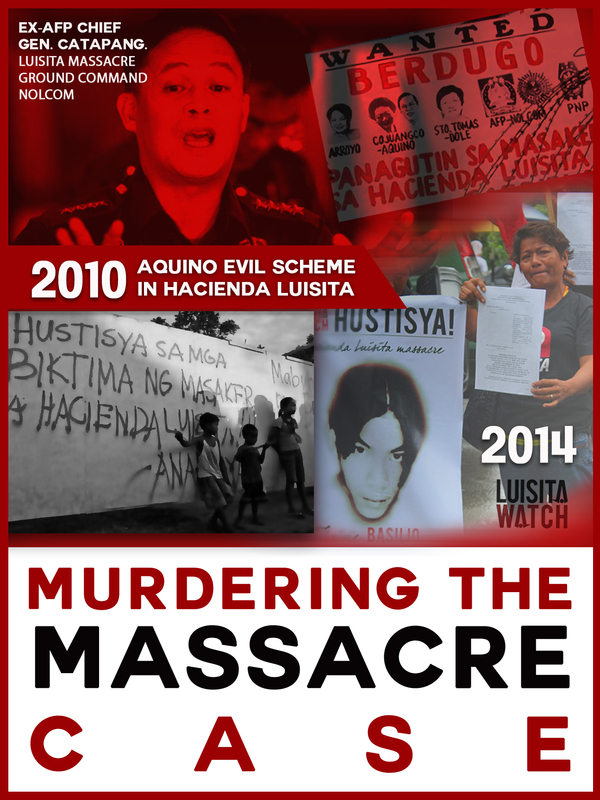 The Hacienda Luisita massacre case filed before the Office of the Ombudsman, by more than 50 survivors and relatives in January 2005, was “murdered” twice under Aquino. BS Aquino, a congressman and active administrator of the estate during the November 16, 2004 massacre, is one of the respondents in the case. Aquino,and other civilian respondents such as former Labor Secretary Patricia Sto. Tomas, were immediately cleared of charges in July 2005. The case against police and military respondents, however, was silently junked by the Ombudsman only a few months into BS Aquino’s presidency. The Ombudsman’s Military and Law Enforcement Offices (MOLEO) dismissed all charges against police and military respondents in December 2010, based solely on NBI reports and without any other efforts to conduct a more thorough investigation. In August 2014, survivors and relatives of the victims filed a motion to reopen the case. The motion was junked only a few months later in October. Instead of prosecution, military officials involved in the Hacienda Luisita massacre were given juicy promotions by BS Aquino. Recently retired AFP Chief, Gen. Gregorio Pio Catapang, was one of the ground commanders during the violent dispersal, along with Gen. Ricardo Visaya who now holds the reins in the AFP Southern Luzon Command. Under Aquino, even hitmen went scot-free – Pfc. Roderick U. Dela Cruz, the soldier implicated in the killing of Central Azucarera de Tarlac Labor Union (CATLU) President Ricardo Ramos in 2005, was acquitted in December 2013. 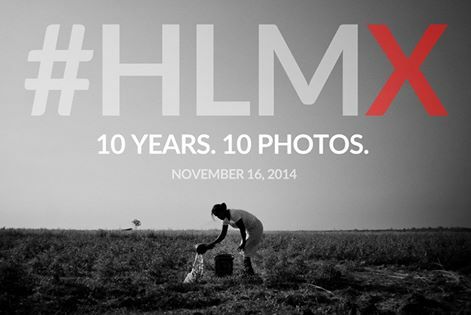 It’s been eleven years since the Hacienda Luisita massacre of November 16, 2004. Without genuine land reform, farmworkers expect nothing but the perpetuation of injustice and impunity – landlessness, hunger, and brutal repression. Our call to end impunity is just call absolutely independent of the mudslinging circus oppressors and dirty politicians busy themselves with towards the 2016 Presidential Elections. Luisita Watch has its eyes open only for truth, accountability and our unwavering support to the peasant struggle for genuine land reform and social justice!